Very compact, affordable 2- and 6-channel PPM/loudness touchscreen meters. These modern and elegantly-styled units are ideal for use in small OB vehicles or control rooms, viewing suites and similar secondary areas. The screen layout is user-configurable, and may include loudness, PPM and True Peak, SPL and DialNorm displays, plus phase correlation. Various software license options are available, including BBC-style moving coil PPM emulation. Also available: the 8-channel TM7 and 16-channel TM9 touchscreen meters have larger displays and a greater range of measurement and I/O options. 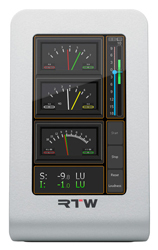 The TM3 is one of the RTW range of touchscreen-based audio metering and analysis displays for use in professional broadcast, production or recording studios. It is particularly stylish and neat in design, and is ideal for use in smaller operational areas such as viewing suites, editorial offices, edit suites and small OB vehicles. The TM3 provides the user with all the information necessary to achieve accurate sound level and loudness management when working in stereo or 5.1 surround formats. The TM3 is available in stereo and 6-channel versions; the stereo version may be upgraded to 5.1 by the purchase of the 6-channel licence. Both versions have a 4.3” 480 x 272 pixel colour touchscreen. The available metering options are the same for the two versions, and users may configure screen layouts to include whatever combination of “measurement instruments” is appropriate to the task. The layouts are entirely definable by the user using the DC1 software application supplied with the unit; each instrument’s display is a window which may be made active, sized and positioned at will. All instrument controls are accessed by touching the screen. User presets are provided for storing the most commonly used screen configurations, and smartphone-style technology is employed to permit selection of these by simply “swiping” across the screen with a finger. Physically, the TM3 consists of the display, an interface box with all I/O, and a separate PSU. The interface box connects to the display with a single 2 m cable giving great flexibility in mounting. The TM3 provides PPM metering with both analogue scaling (DIN +5, Nordic, British IIa/Iib, SMPTE20/24 and NHK) and digital scaling (-60 dB to 0 dB/-60 dB to + 3 dB TruePeak, quasi-DIN, quasi-Nordic or quasi-British IIa/IIb), with Peak Hold and Zoom modes. Loudness/SPL measurement compliant with EBU R128, ITU BS.1771, ATSC A/85 and ARIB is also available, including the Loudness Range (LRA) display. Phase correlation metering and an AES3 status monitor are further instruments. An optional TM3-SWMC software licence allows the TM3 to emulate a classic ‘BBC-style’ dual-needle moving coil PPM. In addition to the standard red and green needles for left and right channels, the display adds a shorter third (blue) needle indicating loudness units. Peak and integrated loudness values are also displayed numerically. The TM3 is designed to interface directly with analogue equipment as well as today’s all-digital broadcast infrastructures. It comes with two balanced and two unbalanced analogue inputs (cannot be used simultaneously), an unbalanced S-PDIF digital input and three balanced AES3 digital inputs. All digital inputs have loopthrough outputs for the connection of downstream equipment. A GPIO port is included to permit external selection of unit configurations, and a USB port to allow connection to a PC or Mac for configuration, or 2- to 6-channel upgrade.